Our Magnetic Paint is the perfect alternative to traditional notice boards and magnetic boards. The advantage of magnetic paint is that it can be easily applied to larger surfaces, so that bare walls in meeting rooms, canteens and corridors can be used in their entirety. Our magnetic paint enables you to present the right information at the right location in an appealing way. No matter whether it’s in the office, the warehouse, the workshop, the waiting room, the store, at school or at home. Since you can easily paint over our Magnetic Paint, the colour can be adapted to the style of the interior. This results in a presentation wall that is not only useful, but an eye-catcher as well. 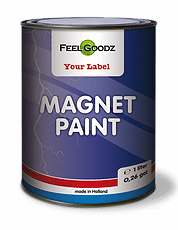 For optimum results, Magnetic Paint users are advised to use neodymium magnets on our magnetic paint. They differ from other magnets by their strong attraction to the iron particles in our paint. 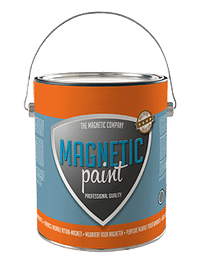 Magnetic Paint is a water-based wall paint which contains iron particles that attract materials with magnetic properties. The secret to our paint formulas is the use of very high quality and ultra-fine raw materials, which ensure a better attraction and a smoother surface. When the number of magnetic paint layers is geared to the weight of the materials or magnets that are attached to them, our customers can enjoy an appealing presentation wall for many years to come, which can be re-arranged whenever they want. At The Magnetic Company we have developed 3 paint formulas. To all of these formulas the same rule applies: the more magnetic paint layers are applied, the more raw materials will wind up on the wall and, therefore, the stronger any magnetic material will be attracted. We have been successfully selling this super strong basic formula to our European customers for over 10 years now. The paint guarantees professional processing, a smooth surface and a strong attraction to magnets. This is thanks to the use of high-grade fillers and ultra-fine iron particles. Because of its light grey colour, wall paints with light colours will easily cover this magnetic paint. This magnet paint creates a wall that is not only functional, but also stimulates creativity and is a feast for the eyes. Our Extra Strong formula is the world’s most powerful magnetic paint! This paint is similar to the magnetic paint described above, but contains 20 percent more iron particles. As a result, you’ll need fewer coats of paint to get the desired level of attraction, which will save you painting time. This paint is also very suitable for use as a base layer underneath our whiteboard paint. Thanks to the fine iron particles in the paint, the surface remains smooth (so that you can write on it properly) and it attracts magnets sufficiently. This formula was developed based on a good price-performance ratio, which makes it suitable for sale at builders’ merchants. The paint contains other fillers and magnetite, an iron substitute. This substance is responsible for the magnetic paint’s dark grey colour. If a customer wants a lightly coloured wall, an additional layer of colour may be required to achieve the desired effect. We supply this paint to various (inter)national clients under private label. Do you have ideas about collaboration or distribution? Or do you want to know what else we can do for your business? Please feel free to contact us. Do you deal in quality paint, whiteboard markers or magnets and do you want to offer something extra to your customers by selling them our quality products? Or do you want to know what else we can do for your business? Please feel free to contact us.